← Pop’pea – a peculiar rock opera and an even more peculiar experience! Speaking on topic, it was an instant buy. I love it. It’s brilliant. It has the best sequencer I’ve found on the iPad. I have the iPad air, it plays nice, but it has a large buffer and even with my Launchkey mini it still lags a little. the UI is a little laggy too. But that’s with all Korg’s apps. Hopefully, when Michael & Sebastian from Audiobus will whitelist it and it will appear in our slots, I’ll be able to force its buffer to 256 and gain some speed. PS: Check out http://www.youtube.com/watch?v=0yUMh-O9fp8 UVI Beathawk. It seems they have a winner there. Hi Alex, losing stuff is an occupational hazard I have. Probably down to the fact that I sometimes work very late into the night and get a bit sleepy on the job! Whoops! should be working now, sorry about that! Hi Gaz, still no luck with the videos. Tks! Hmm the vids should be working now. Maybe try refreshing my blog post. Don’t know if it’s my problem but I keep refreshing the page and every time I get the “video not available” message. I just now was able to find these 2 videos searching directly in youtube (they weren’t showing up before), so I will watch them there. Thanks a lot for taking the time to do this review! I always enjoy reading your blog and watching your videos. Hey Gaz, nice video. I posted a link on the Audiobus forum. I found this when looking at the file structure..
For me this was also an instant buy. I love Korg apps, also on PC. 1) Is there an undo option ? Particulary if you record automation parameters by fidling the knobs and buttons, things sound fantastic but eventually somethings goes wrong. 2)Is there a reset-track or reset-automation somewhere ? 3)When i play with the main cutoff knob in Chicago 303 unit, 6 out of 10 times i get to see the gadget-selection screen. Does that happen to you ? or is there a lock option somewhere to lock the screen to a device ? 4)Is there a rotation/linear setting for the knobs ? 5) In the information (I) button om the main screen, Gadget lists all the other Korg apps I have installed and also the ones I haven’t installed. But when I press on one of them, nothing happens. 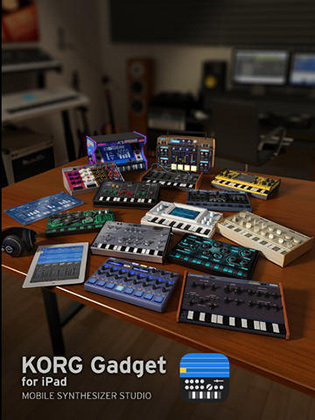 Do you know if Korg plans to integrate apps like IMS-20 or IElectribe ? I hope you can find some time for my questions, I wouldn’t want to take too much of your time, that you could spend at Gadget. Hi Sander, good find! There were some things there that I didn’t know such as slide left on an automation track’s name to delete. Also I hadn’t looked in the iOS settings either where there is some useful settings for reducing latency and changing knob gesture (which was one of your questions!) it’s also interesting to see the control for background audio says that when used with Audiobus is automatically switched on. This bodes well for an early update including support for Audiobus. I think you may have found out all the answers you were looking for but is there anything I can still answer? But now I have your attention for a few seconds. Lately you seem to develop a love for deep and complex apps. Great ! Let other people cover the shallow apps. Have you ever tried the free version of Noatikl 2 ? There are so many options and parameters in that app… maybe worth a look ? And please do continue to release your own video’s about apps.